USA Automotive is Raleigh’s go-to automotive expert when your vehicle has lost the ability to crank the engine and you’re in need of vehicle charging system services. What is a Charging System? Your vehicle’s charging system is how your ignition gets the power to turnover. A fully-charged battery can supply the starter motor with current to start the motor, but after several years on the road the battery will wear down. The quiet clicking sound you hear instead of a roaring engine means that your vehicle’s charging system needs to be repaired. So how do we provide repair for your charging system? We provide the necessary battery repairs or replacements for your vehicle. This also includes all of the components that start and maintain your engine and battery power, such as the alternator and starter. Although the charging system failure is something that catches many owners off guard, it never has to be an interruption to your morning. At USA Automotive, our team of qualified automotive technicians provide a thorough inspection about every sixth months or so. Being proactive is the key to making sure you are never without the battery power to start your car. Drivers who bring their vehicles in for routine maintenance will never come out in the morning to a surprise. Our technicians will let you know the condition of your vehicle’s charging system before anything goes wrong. We’ll identify the early signs of a failing alternator or battery and perform the appropriate battery repair or replacement services. Turning the key in your ignition, and only getting a click, a choking sound, or silence is a horrible feeling. Your vehicle’s startup needs to be automatic and reliable every time you get behind the wheel. That’s what our team promises with our routine charging system maintenance services. Sometimes you may not have an actual problem with your battery, alternator, or starter. Instead, the problem could be the connection to one of these components. Often, we discover that there is corrosion on the battery terminal ends. This can also lead to your vehicle failing to start up properly. At USA Automotive, our certified technicians will discover any issues like these during your routine maintenance. We can perform a service that will remove any unexpected corrosion and help prevent it from developing in the future. 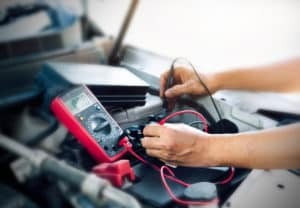 If corrosion is not caught and eliminated, it can destroy not just your vehicle’s battery but also the battery cables and terminal ends that connect to the battery. Our automotive technicians perform accurate tests that will give you the true condition of your battery, alternator, and starter. Any other parts that affect your charging system, like your drive belt, will also be serviced or replaced during our routine maintenance services. To enhance your vehicle’s overall performance, you must make sure your charging system is operating properly. Our automotive team is determined to keep you off the side of the road by ensuring that you receive the best charging system services in the 27604 area of Raleigh. Our customers trust our technical expertise as well as our service guarantee. We believe in worry-free auto services, and our top quality guarantee gives you complete assurance that you’re receiving the best automotive services in the area! Schedule Your Charging System Repair Service! 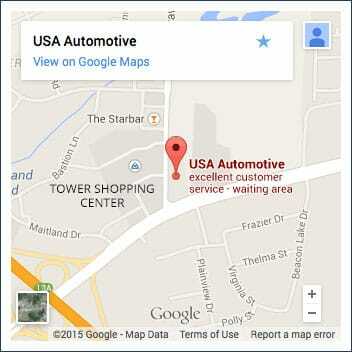 USA Automotive is here to make sure you can start your engine without a second thought. Our routine maintenance services will never leave you stranded. If you are having trouble starting your engine and maintaining power to your vehicle, it’s time to bring your vehicle to us as soon as possible. We can perform quality battery repairs and replacements for vehicle charging system malfunctions to get you back on the road in no time. Give us a call today at 919-249-5295 to schedule your vehicle’s charging system service appointment. For your convenience, schedule your next appointment right now, using our online scheduling system!